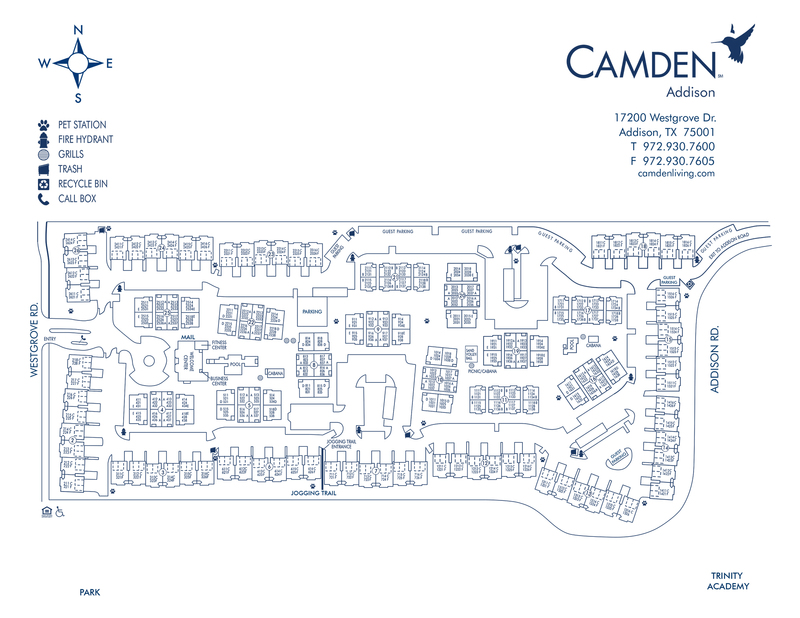 Camden Addison offers one and two bedroom apartment homes in the highly sought-after city of Addison, TX, just minutes from Dallas North Tollway. Addison Circle Park, Vitruvian Park, and the Galleria are all right around the corner with lots of great shopping, dining, and entertainment. Camden Addison apartments welcome you home with amazing amenities. Walk-in closets, private patios/balconies, hardwood-style flooring and wood-burning fireplaces are just a few examples of what we have to offer inside every apartment. Features of select units are designed with convenience in mind, such as private garages or walk-in showers. Within our community, perks are not in short supply. Choose between two resort-style swimming pools, entertain friends, and family in our grilling lounges, and feel the sand between your toes on our sand volleyball court. Hard day at work? Burn off some steam in our 24-hour fitness center. By entering the clubhouse, you have access to free Wi-Fi, a beautiful view of our main swimming pool with water feature and our onsite business center where you'll find complimentary gourmet coffee, high-speed WiFi, a quiet space with comfortable seating and a printer. As a resident, you also receive a free membership to Addison Athletic Club. We have perks for your pet too! Our apartments are next to the jogging trails of North Addison Park and just 3 miles from Wagging Tail Dog Park and NorthBark Dog Park. There's a Kroger grocery store 1.2 miles away that takes less than 5 minutes to get to. On the weekends, hit the links at The Golf Center at the Highlands, only a 3-minute drive. For those who work as hard as they play, you will love the convenience of living near President George Bush Turnpike, Dallas North Tollway and Love Field Airport. Residents receive a technology package included in the total monthly rent with a savings of up to 53% off retail. This money-saving package includes high-speed internet up to 300 Mbps and 225+ digital channels including 120 HD channels. Looking for more options? Access Spectrum Cable TV from your smart device + over 250,000 Spectrum WiFi hotspots nationwide. Our beautiful grounds and focus on great service set us apart from other communities. Come by today and experience the difference, at Camden Addison. We'll save a spot for you! We reserved one parking space per leaseholder on a first-come, first-served basis. Visitors are welcome in all spaces labeled Guest Parking. Select apartment homes come with Attached Garages! Carports are available for $20 - $25 per month. Call us with questions about Parking!